Cozy Cabin surrounded by native flora and fauna in rural Meadows of Dan, a Patrick County treasure. From the Int. of Bus. 58 and Squirrel Spur Rd (Rte 614) in Meadows of Dan, Travel south on Squirrel Spur Rd 3.2 mile to a right at second Mayberry Church Rd. intersection. Property is the second house on the right. 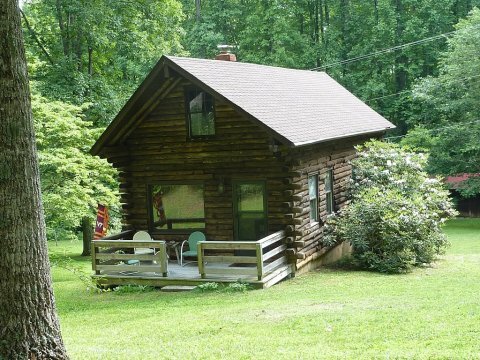 Lovely getaway cabin on 1.10 acre. 2 bedrooms, 1 full bath, 2 half baths with a living/kitchen combo on a full basement. Surrounded by woods with the National Park Service as your neighbor, you are insured no further development across from you. Front porch, large covered porch and lower patio allow for plenty of outdoor enjoyment. Gas logs with masonry encasement and hardwoods are part of the quality in details. Minutes from the Blue Ridge Parkway and Meadows of Dan.